We are a leading Manufacturer of mobile low profile weigh pads from Bengaluru, India. Came into existence with sole goal to achieve excellence in our domain, we are involved in manufacturing, supplying and exporting Mobile Low Profile Weigh Pads. These pads are portable in nature and integrated with highly efficient battery sensors that sense the weight. 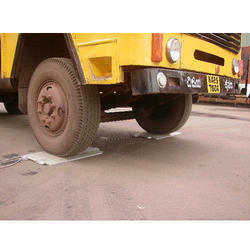 Offered pads are widely used in commercial sector for weighing different types of trucks, vans and other vehicles. We conduct different quality tests on our Mobile Low Profile Weigh Pads to ensure their flawlessness. Looking for Mobile Weigh Pad ?